After Milo Yiannopoulos’ appearance at MSU Tuesday, a handful of protesting students were arrested by MSUPD. And today it came out that Milo has donated $17.76 to aid in the bail of the arrested protesters. As if being arrested wasn’t frustrating enough, they now have to deal with the fact that Milo has donated a laughable amount on their behalf. Once again, he is using the pain of others to try to stir up controversy and gain publicity. 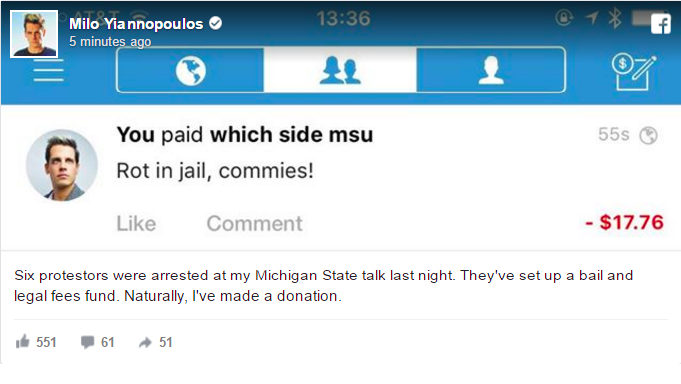 More frustrating than the donation, however, was his comment that came along with it: “Rot in jail, commies!” Milo wrote on the Venmo transaction. Milo’s continually sarcastic and demeaning comments only make things worse for the protesters and Which Side MSU?, the movement they were with. This feeble attempt to make fun of the protesters is infantile and unfortunately succeeds in spreading his discriminatory rhetoric. We passed, and took their sign too. Sorry about it! Milo also bragged about his “trolling” of the protesters and the stealing of their banner, which only proves that he will do whatever it takes to make fun of people he disagrees with. Yes, this country flaunts the people’s right of free speech, but there has to be a distinction between free speech and slander – and if incorrectly labelling protesters as “commies” doesn’t count as slander, I don’t know what does. This is an important time for Spartans to show support for their fellow classmates who have now become the brunt of Milo’s jokes for the past three days. His spread of xenophobia, sexism, and racism has infiltrated this campus and this is only further demonstrated by his insulting donation and comments that accompanied it.